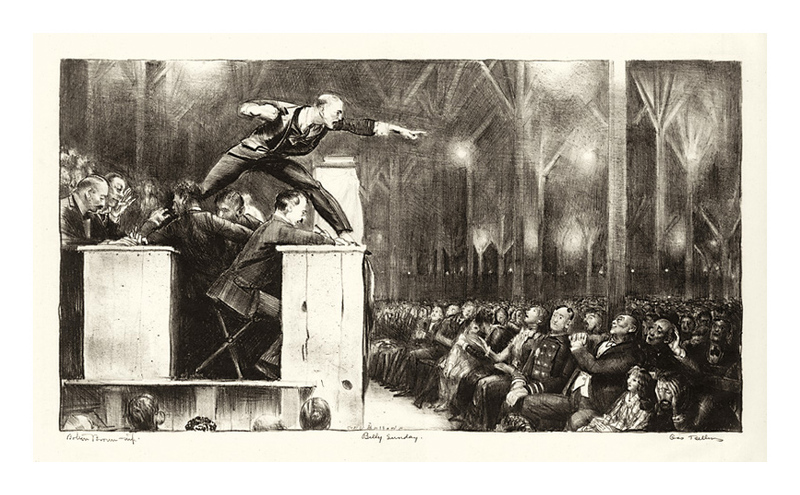 Billy Sunday was a forceful, colorful American evangelist whose charisma simultaneously attracted and repelled Bellows. Here the artist objectively studies the relationship between the protagonist and crowd, complete with harsh gestures and sensationalism. Bellows’ composition emphasizes a geometric pictorial structure of horizontals and verticals, punctuated by Sunday’s violent lunge into the enthusiastic audience. Isabel Bishop was a member of the so-called 14th Street School in New York City. With a figurative style focusing on contemporary life in a teeming urban setting, Bishop often depicted shoppers, lunch-time crowds, young sales girls and strollers in the park. Bishop approached etching by drawing on the plate directly from the model. She continually reworked her images. Soda Fountain was executed in five states or versions, this being the second. The ink lines and wash added to the printed image show Bishop’s reconsideration of the forms, lights and darks. Kyra Markham won widespread recognition for the lithographs she made for the WPA’s Federal Artist Project from 1936 into the early 1940s. Markham portrayed the life she saw around her, as did others of the “14th Street School,” including Kenneth Hayes Miller, Isabel Bishop, Raphael Soyer and Reginald Marsh. Since the 1920s, women shoppers and workers exemplified a new consumerism. Although sympathetic to them, Markham tended to exaggeration and humor. 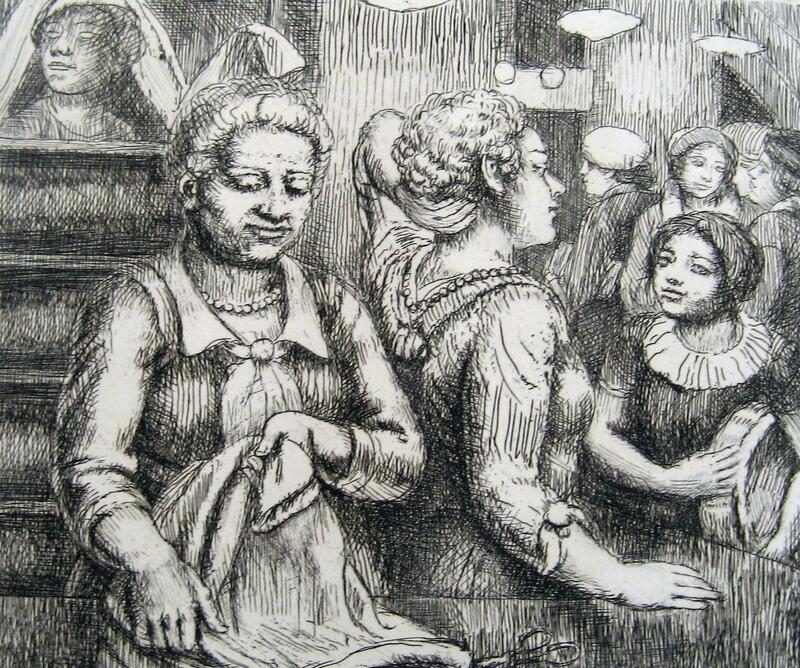 Here customers of different ages and ethnicities are caught in unflattering postures in a communal dressing room’s decidedly ungenteel atmosphere. Known as “the poor man’s Fifth Avenue,” 14th Street was a bargain hunter’s paradise where women would mob the racks. As an urban realist, Kenneth Hayes Miller found many of his subjects in the bustling neighborhood stores of his New York City studio on 14th Street. The design for Saleswomen reveals the artist’s devotion to the essentially Italian Renaissance classical ideals of balance, order, and harmony. Miller’s importance as an artist, although substantial, is rivaled by his extraordinary influence as a teacher at the Art Students League in New York from 1911 to 1951. There he taught two generations of artists including Isabel Bishop, Reginald Marsh and George Bellows. He was considered the leader of the “14th Street School,” a late extension of Ash Can Realism.